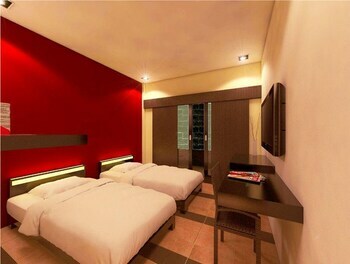 With a stay at The Zuk Hotel Kuta in Legian (Legian City-Centre), you'll be minutes from Swiss Consulate and Kuta Beach. Free self parking is available onsite. When you stay at RedDoorz near Pejaten Village in Jakarta, you'll be 14 minutes by car from Ragunan Zoo. Self parking (subject to charges) is available onsite. With a stay at Airy Grogol Susilo Raya 113 Jakarta in Jakarta (Grogol), you'll be within a 15-minute drive of Tarumanagara University and Neo SOHO. Located in Mataram, Airy Mataram Cakranegara Sriwijaya 132 Lombok is a 5-minute drive from Mataram Mall and 8 minutes from Mayura Temple Park. Located in Batam, Amaris Hotel Nagoya Hill - Batam is connected to a shopping center, within a 15-minute drive of BCS Mall and Harbor Bay Ferry Terminal. Free self parking is available onsite.